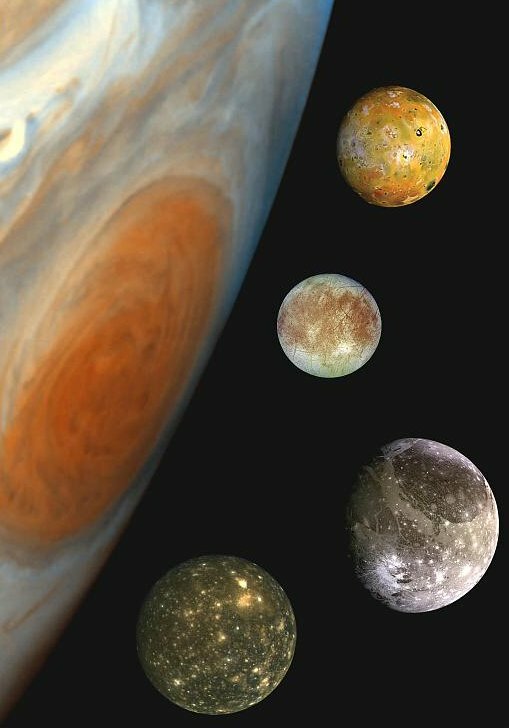 A montage, to scale, of the four largest moons of Jupiter and Jupiter's Great Red Spot. The largest planet in the solar system, Jupiter, has 63 known satellites. With one exception – Themisto – these moons fall into four major groups. The inner group of Metis, Adrastea, Amalthea, and Thebe are small- to medium-sized, orbit in nearly-circular paths at less than 200,000 kilometers, and were discovered as a result of images sent back by the Voyager probes. The Galilean moons, Io, Europa, Ganymede, and Callisto, have orbital radii of 400,000–2,000,000 kilometers and are among the largest satellites in the Solar System. The third group includes Leda, Himalia, Lysithea, and Elara, which were discovered in the twentiethth century but pre-Voyager, and S/2000 J11; all have diameters of less than 200 kilometers and orbits of 11 to 13 million kilometers with inclinations of 26–29°. The fourth group, composed of several subgroups, includes four moons, Ananke, Carme, Pasiphae, and Sinope, whose twentieth-century discovery predates Voyager, plus many others found recently; all, with the exception of Pasiphae, have diameters of less than 50 kilometers and high-inclination, retrograde orbits with radii of 19 to 30 million kilometers. It is thought that the three groups of smaller moons may each have a common origin, perhaps as a larger moon or captured body that broke up into the existing moons of each group. All Jupiter's moons are tidally locked with the planet so that their rotational periods and orbital periods are the same. All the known moons beyond Carpo move in retrograde orbits. For further details on some of the moons that have been given proper names, see individual entries (click on the names in the table below). They are listed in order of increasing distance from the planet. The values of semimajor axis and orbital period, eccentricity, and inclination, for all the moons of Jupiter beyond and including Themisto were obtained from the Natural Satellites Empheris Service of the IAU Minor Planet Center (http://cfa-www.harvard.edu/iau/mpc.html).